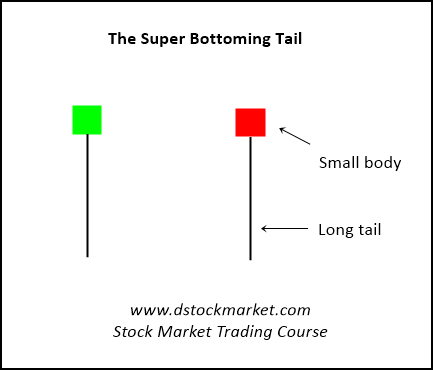 If you have seen a bottoming tail, then the super bottoming tail is the same pattern on steroids. It often signals a fast bullish reversal back to the upside. The pattern is super easy to spot and they are often very reliable. When you see this pattern, it often tells us that the stock is rejecting to go lower. Please note that the tail is at least 3 times longer than the body. If its smaller than that, it is just a normal bottoming tail. Now that you have understand the construction of this pattern, let me take you through the psychology of this candlestick pattern so you can really appreciate the power behind this pattern. As you already know, the stock market or any other market for that matter, is made up of human players. Therefore, the emotion of greed and fear rules the market. When a stock or index starts to roll over after a top, it will usually start to fall gradually. As the drop progresses, more and more people become scared as the value of their portfolio goes down. Eventually there will be a panic selling towards the end of the move. This is where everybody starts to throw everything they own out of panic. It is known as a climactic selling and this is often accompanied by heavy volume. What makes a stock or index go down? Selling pressure isn't it. So when everybody has thrown in the towel and there is no one left to sell, imagine what will happen to the stock price? It will be like a spring that is released and it will quickly snap back up. This is what we often call a "V" shape recovery because the rise is just as rapid as the decline. The super bottoming tail is actually a visual picture of the "V" shape recovery that happened in the stock price. The beauty of candlestick patterns is that it enables the trader to quickly see emotions of market players at a glance. So if you are able to read the minds of other people, you may be able to use that information to profit from it. Let's take a look at a real live example of the super bottoming tail in action. Right here at www.dstockmarket.com we do not only give you theory. In fact we give you the theory and real live examples so that you will be able to learn from it and spot them in the future. The chart above is the 60 min chart of the S&P 500 Futures. From the 24th onward, the futures started to roll over. It tried to stay afloat and move sideways but eventually the S&P 500 futures begin to crack and breakdown. Once it dropped below the 60 min 200 MA, the futures started to tumble. Eventually there was a climactic selling and panic gripped the market. As the futures reach the support area, selling started to become less and buyers stepped in. The result was a super bottoming tail that formed around 2548. The presence of the super bottoming tail told observant traders that the market was rejecting to go lower. Smart traders would have started to buy the futures. Notice how the S&P 500 futures quickly shoot up after the appearance of the bottoming tail. That would have made a nice fast trade. 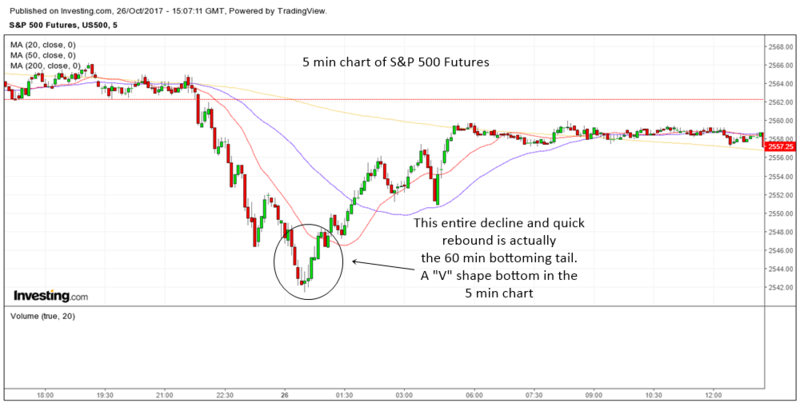 Let's take a closer look at the 5 min chart of the S&P 500 futures. The chart above is the 5 min chart where the hourly super bottoming tail happened. The circle that I have drawn on the 5 min chart is actually a 60 min super bottoming tail. Notice how during the climactic sell off, the index declined rapidly only to recover just as fast forming a"V" shape bottom. See how the index shot up after the "V" shape bottom or 60 min super bottoming tail formed. This quick rapid recovery may surprise many but now that you know the existence of the super bottoming tail, you will not be surprised anymore. 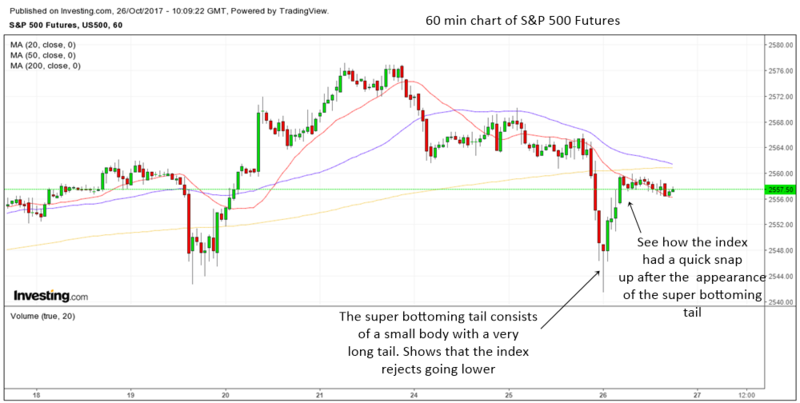 In fact, you can start to take advantage of this knowledge and learn to spot future super bottoming tails. 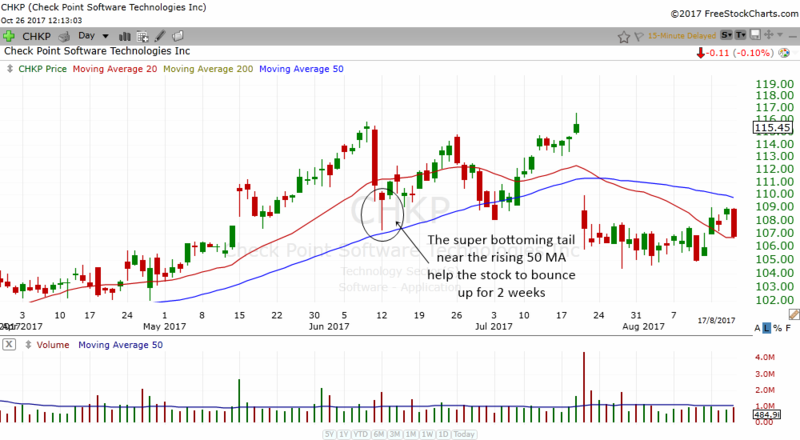 The chart above is the daily chart of CHKP. Notice how the stock had a quick crash in June 2017. There were two days of selling. The first day was a large red bar. The second day would also have been a large red bar but the stock managed to close away from the lows and formed a bottoming tail. Sometimes, stocks tend to end their rapid sell off when they are near the powerful daily 50 MA. This was the case for CHKP. 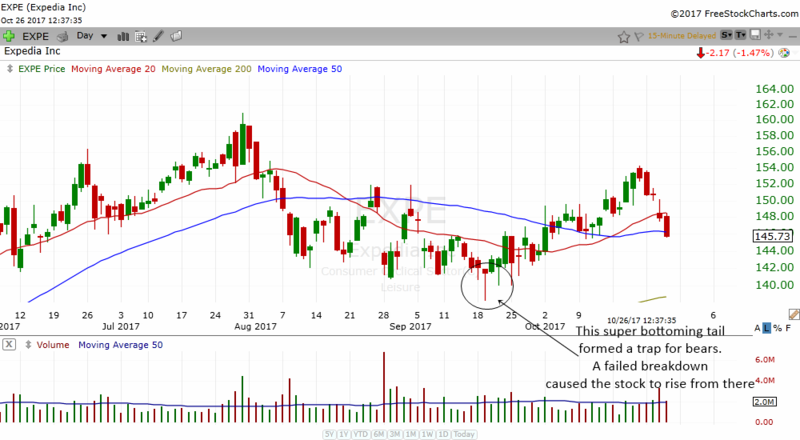 As the stock declined near to the 50 MA, buyers stepped in. Those who wanted to sell would also have sold. Therefore, the stock had a quick bounce up to close far from the lows. Notice how the stock managed to drift higher for 2 weeks after the appearance of the super bottoming tail. Pretty powerful stuff isn't it? Super bottoming tails are known to end correction and downtrends. This was the case for CTXS. The chart above shows how CTXS experienced a decline from July to mid August 2017. Then a super bottoming tail formed which told traders that the stock was rejecting lower prices. 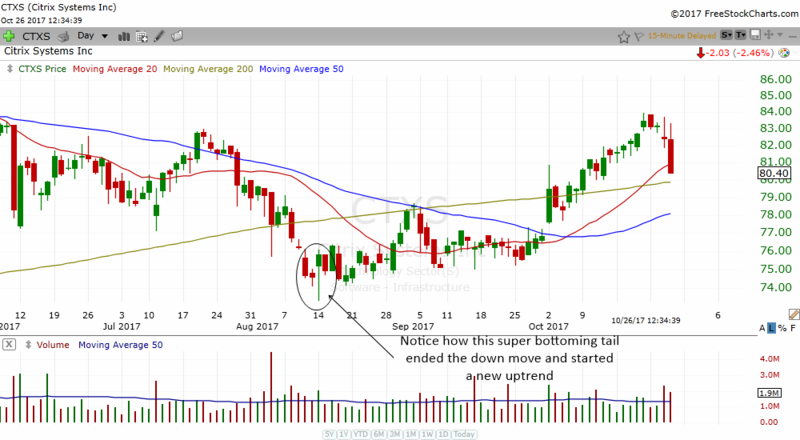 The super bottoming tail marked the bottom for this stock and see how it started to drift higher and eventually started a new uptrend. The last example I want to show you is EXPE which actually suffered a failed breakdown. The stock was actually trading sideways and it started to breakdown when it moved below the lows of the consolidation. However, the breakdown failed when the stock closed near the highs to form a bottoming tail. This trapped many bears and eventually they needed to cover. Notice how the stock started to move higher after the appearance of the super bottoming tail. You have now learned a very powerful bullish reversal pattern. Please don't confuse this with the normal bottoming tail. The super bottoming tail is extraordinary and it has a long tail that tells us the stock rejects lower prices. Learn this pattern well and perhaps you might be able to spot a great trading opportunity in the future.